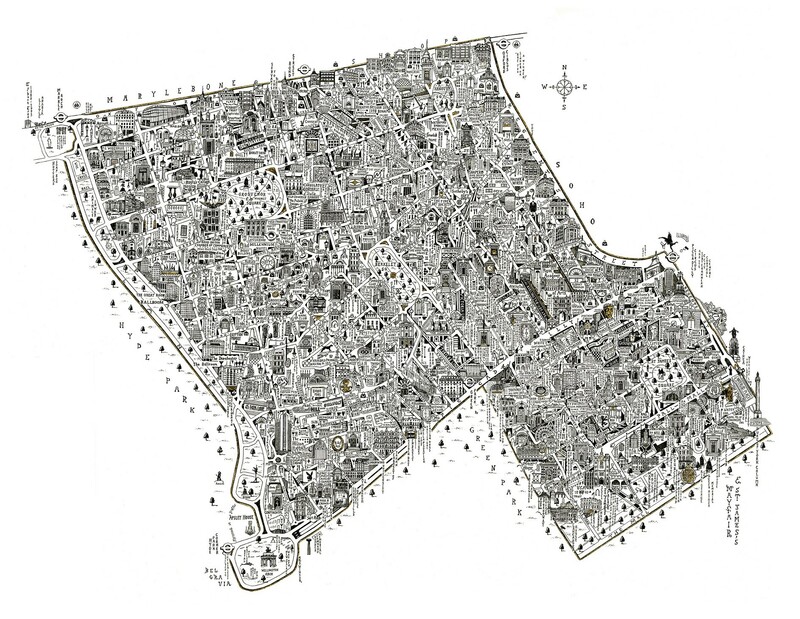 We’ve long been fans of artist Stephen Walter’s monochromatic cartographical style and have featured numerous map-based artworks by him over the years. It’s been interesting seeing his style subtly evolve, from intense and slightly angry detections of “seas” of houses and caustic comments, to the slightly more restrained, but still very distinctive, style of his more recent works, including this piece, “Mayfair & St James”. 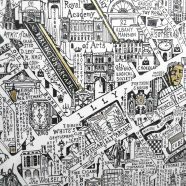 The work covers the opulent Mayfair and St James’s districts of London, in Stephen’s forensically detailed “sketching” style but with the addition of gold leaf to highlight certain roads and park areas. The glint of the gold leaf adds an appropriate sparkle to the map of the area. Stephen has also extensively written labels vertically, with lines of letters falling down. 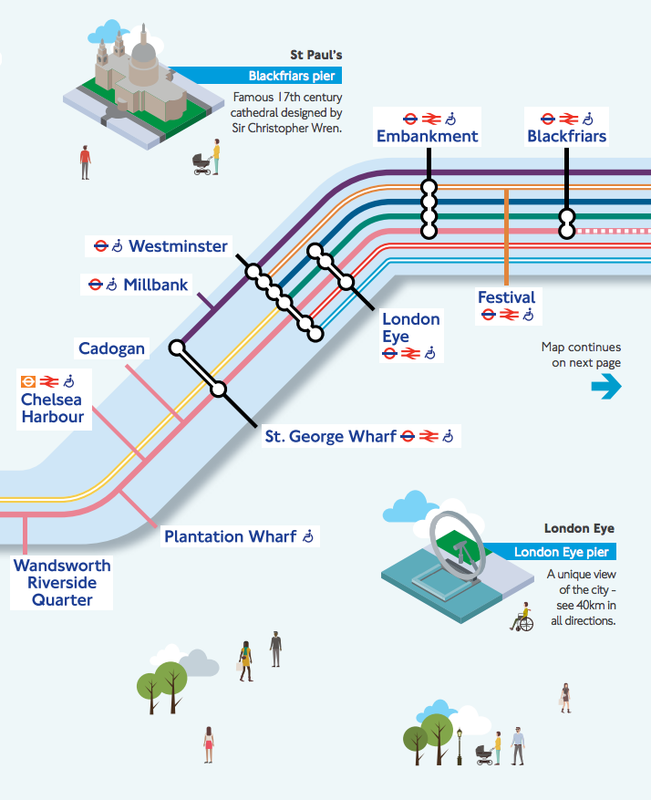 This helps with the annotation of the area and is a rather pleasing style that makes it feel less like just being an intensively detailed map. The vertical writing, and level of detail, ensures this is a work that people will spend quite a bit of time looking at. The work is co-published by by TAG Fine Arts and Shapero Modern and the work is available in an signed and numbered edition of 75 from the two galleries. 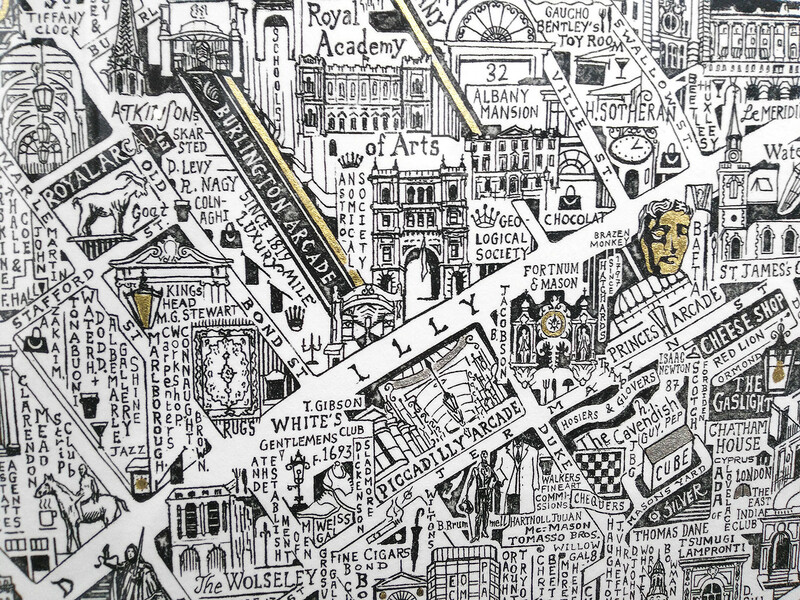 Thanks to TAG Fine Arts for inviting Mapping London to the London Original Print Fair, where this work was exhibited.